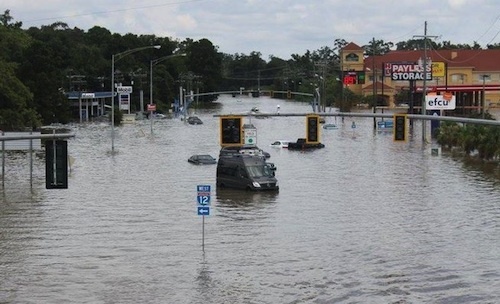 On Sunday the federal government declared a major disaster in Louisiana after days of torrential rains caused flooding that killed 6 people and required over 20,000 rescues. Some of those rescues occurred along Interstate 12, which was closed from Baton Rouge to Tangipahoa Parish. 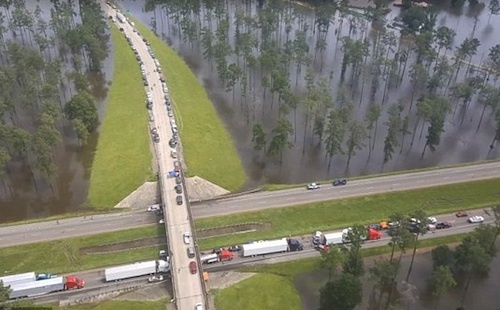 Motorists and truck drivers were stranded for over 24 hours along the stretch of road but for many, it became somewhat of a community of people helping people until rescuers arrived. "We got together and whoever needed anything we just all chipped in,” one of the motorists later told reporters. “Take lemons and make lemonade I guess right?" Truck drivers gave up their sleeping quarters and offered them to mothers with small children who needed rest and air-conditioned refuge. Another truck driver, who was on a job hauling produce, determined the dire situation warranted breaking into his load to hand out fruits and vegetables to those around him. And one truck driver even made a big batch of spaghetti in his cab kitchenette and then used his bullhorn to announce it was being served. In fact, the camaraderie amongst the people stranded along that particular stretch had rescue workers in awe of what they saw. 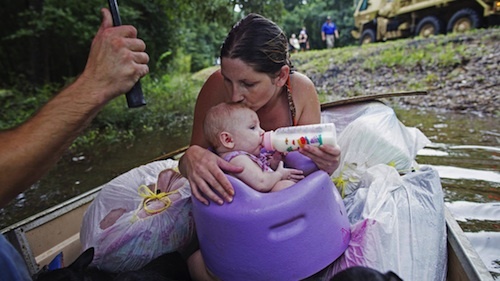 "It almost brings tears to your eyes, the idea that they were happy to just be getting water and some basic supplies," said Tangipahoa Parish President Robby Miller. Unfortunately not everyone had the same experience and those stranded further down the road suffered far worse conditions with little water, food and a lack of information. "It is hot and humid and there is no place for anybody to go," said Julie Cobb, who was stranded with her husband and two young boys. "People are not prepared for this situation." Cobb also said that although there were attempts to drop meals and supplies to the stranded motorists from helicopters, there was no way to ensure that everyone got their share. "Everybody just takes off with it," she said. She also said there were babies, nursing mothers and family dogs everywhere needed food. Many flocked to a nearby convenience store that was only able to allow five people in at a time and the merchandise quickly cleared out. A nearby church allowed stranded motorists to access its single bathroom, but the mass of people soon resulted in a long line-up and made it difficult for everyone to get a timely turn. On Sunday the National Weather Service said the storm system is moving from southern Louisiana with a flood warning to the north. The deadly storm is making its way into the Midwest, where officials are already braced for major flooding. It's been 11 years since there has been a really bad weather event for the Gulf coast and I figure it's coming to repeat history in the making. Don't forget to salute the truck drivers that watched the weather and knew to stay away after the first foot of rain. That's just a sign of what's to come off the gulf . The President doesn't care about anyone except his own personal agenda. Well he is simply a FAKE. It's determined that it's best if he stays on the golf course! Can't mess as much up! It would be fake if he did show up!